When life hangs in the balance, trust us to put it back on track. Saving lives is our business, 24 hours a day, 7 days a week. 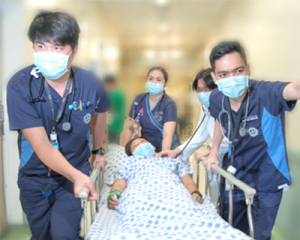 Manila Doctors Hospital’s Department of Emergency provides prompt response to illnesses and injuries through its team of dedicated, compassionate and caring emergency care physicians, committed nurses and highly trained paramedics. With its sudden influx of patients plan, the Department of Emergency medicine is capable of managing unexpected patient load during internal and external emergencies. For your emergency health care needs, our doors are open to serve you.